I have been lately been on a "eat healthy" mode and one of my latest addiction is Shirataki noodles. I didn't know much about it until this year and I really wished I knew about it earlier. Funny thing is that I've grown up seeing these packages of translucent noodles, but I never got to try them because my mom never used it to cook. Of course, she knew all about the noodles but never shared to me about how amazing they are if you're on a low carb, low calorie diet. 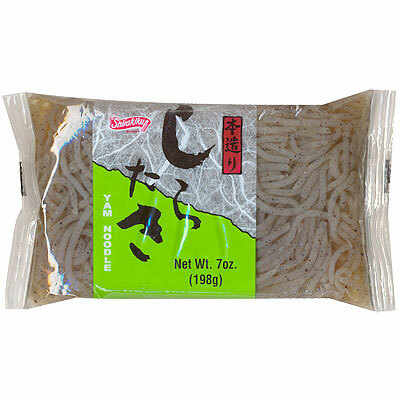 Shirataki is a Japanese noodles made of Konjac yam. It contains largely of water and glucomannan, a water soluble dietary fiber. So pretty much super low calories and carbohydrates! I always describe them as empty fillers that keeps you full. These things can be used just like any regular noodles and immediately take up any flavor. 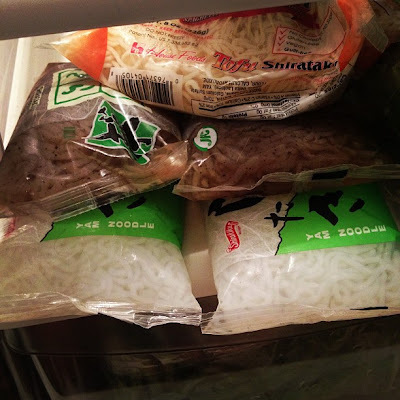 There are many types of Shirataki noodles. The tofu shirataki which looks the most similar to pasta is amazing cooked with any type of sauces. 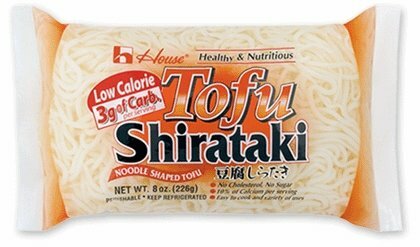 The tofu and shirataki combination gives you a much smoother and softer texture compared to the pure shirataki noodles. I recommend using this like you would in a pasta dish. They also come in different sizes from spaghetti, fettuccine and angel hair! I have to add that the tofu gives it a bit more calories compared to the plain ones but not by much. Now on to the most basic of basic. The regular Shirataki noodles which pretty much consist of Konjac and water. I'm serious! I find these noodles great in soups and stir fry with vegetables and protein. They are great as a filler to keep you full and also make a meal look like a complete meal. Next step up from the plain shirataki noodles are the ones with bits of seaweed added to them. I tried these a few weeks ago and couldn't tell the differences from the regular ones, but I'm A OK with them. I like to use them when I use a soy sauce based stir fry. It gives a rich color which makes the meal even better. 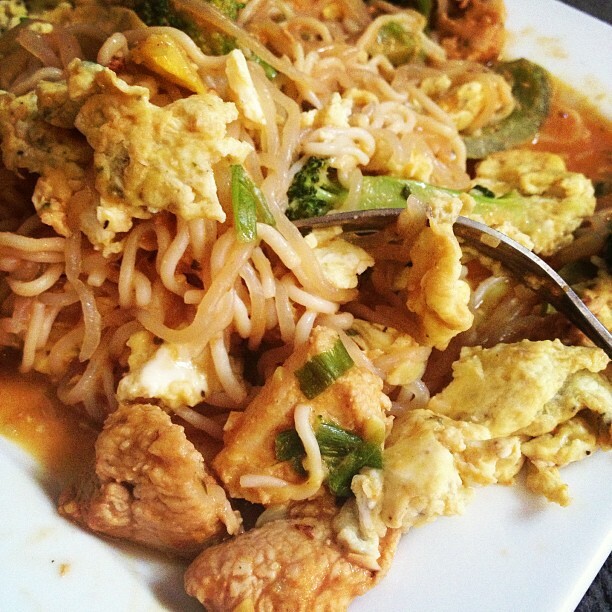 Here's my Peanut Shirataki noodles. I didn't have any peanut butter so I ended up using soy butter which is a good alternative to peanut butter. I'm still a big peanut butter fan though! There's also some veggies and chicken added to give it some nutrients since the noodles itself has none. I must say that was one amazing meal. I loved every bite! There's also another alternative if you're not into the Shirataki noodles (which I can't see why not it's an almost perfect ZERO noodle) but there are also kelp noodles. I decided to give this a try and I must say I like it but not as much as my shirataki noodles. 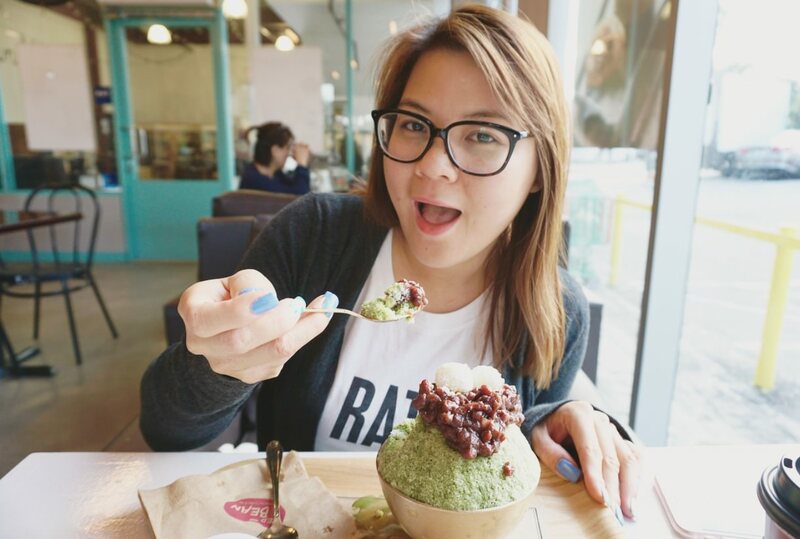 Since these noodles are made of the innards of seaweeds, it gives a much greater crunch or bite to them. I find them a little harder to bite through but it's still pretty tasty when cooked with a great sauce or stir fry. I find that putting them in hot water and cooking for longer in your sauce makes it much tastier. 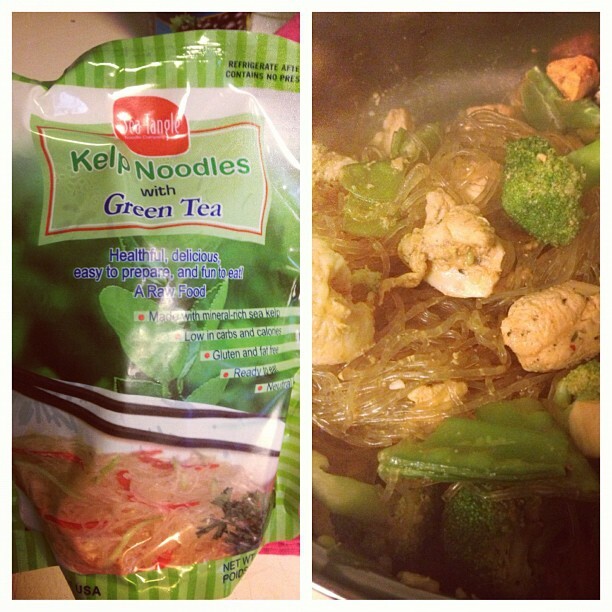 It's a little tougher to cook with compared to the shirataki noodles but they both are great as alternatives. So here concludes my post. I'm a big fan of Shirataki noodles and really recommend it to others that are looking for a noodle alternative with very low calories and carbs. I eat it mostly everyday and you can use it in almost every way a regular noodle or pasta is used. It took me a few tries to perfect a good technique to cook it but I managed and absolute love it! Has anyone tried Miracle Rice by Miracle Noodle? I have and it has become a real favorite!! Soups, salads and vegetable dishes too. recently made an asparagus rissotto (sp!) using it..turned out delicious. zero carbs and calories and so easy..no waiting for water to boil..also find recipes on their Facebook page..Enjoy!